CERIO’s WP-300N eXtreme Power 11n 2.4Ghz 2×2 Wall-Plate PoE Access Point bundles Cerio’s CenOS 3.0 Software core and supports Cerio Wireless Management Software (CWMS), enabling connection to Wireless Indoor Networks for service providers deploying last mile services to education facilities, hospitality businesses (hotels/resorts), and luxury homes. Network administrators can create and centrally manage multiple subscriber service tiers using per-subscriber rate limiting features. The WP-300N Structure (Form Factor) supports both Wall-Plate installation and Wall Mounting. The WP-300N eXtreme Power 11n 2.4Ghz 2×2 Wall-Plate PoE Access Point hardware utilizes 500mW eXtreme power and built-in 2.4 GHz 2×2 Omni directional antennas. WP-300N’s design makes it the ideal solution for inconspicuous and high performance deployment. Cerio’s WP-300N provides in-room connectivity for a variety of environments such as hotels, resorts, universities, and luxurious homes. WP-300N focuses on customers looking for a modern and aesthetically appealing way to improve their network. Strategic placement of WP-300N can replace unaesthetic RJ-45 wall ports and add a sense of modernism to a room or hallway. The WP-300N can provide subscribers with an Ethernet connection for a local access to extend the range and increase the performance of a wireless network. The WP-300N hardware also includes 802.3af/at PoE capabilities that allows power and data to be supplied to the unit using CAT5 Ethernet cable. A USB port located on the side of the device allows users to conveniently charge devices through a USB Charger. Finally, when deployed in public places such as hotels and university campuses, WP-300N’s ensures product safety from theft through its wall-plate design. CERIO’s GS Firmware uses the CenOS 3.0 core . The firmware’s main functions are Wifi application for Router + WiFi Access Point ( Includes Router AP+WDS) and Pure WiFi Access Point (Includes AP+WDS) and Point to Point / Multi Point WiFi Bridge and Bridge + Repeater Extension WiFi AP and WISP/CPE for Router + WiFi Repeater AP functions . The CenOS 3.0 core’s operational mode supports Router AP with WDS mode / Pure AP with WDS Mode / Pure WDS mode / Client Bridge + Universal Repeater Mode and WISP/CPE Repeater +AP mode. 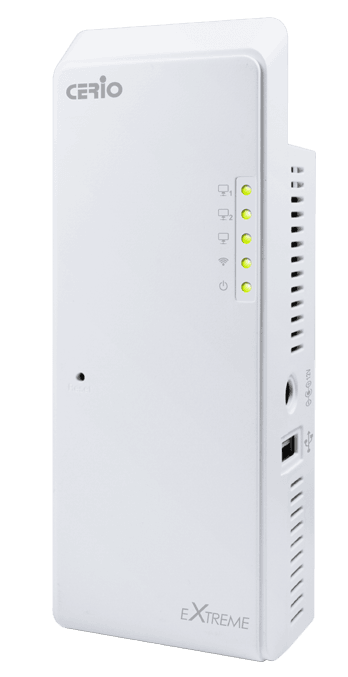 The CenOS 3.0 features that simplify deployment and reduce cost for continued maintenance of the indoor Access Point . The Cerio CenOS is undoubtedly your wifi application best choice. Integragted IEEE 802.3af Power over Ethernet (PoE). Bundles Wireless RF Signal Enable and Disable by time scheduling function to auto reboot function . Support Hardware chipset base Watch Time Dog , The OS will be reboot by automatically before crash. Bundles Cerio CenOS3.0 software Core interface allows for communicating with Cerio Wireless Management Software (CWMS) and CERIO AM-Series AP Management WLAN Switch or Access Controller hardware device of network management servers. Provide Traffic Monitor and Graphical GUI Status Interface. Besides supporting IEEE 802.1Q Tag VLAN priority control, the users can also easily handle network management and maintenance tasks through this unit. The browser interface permits users to monitor node conditions, link quality, manage traffic flow, and view event logs of the IW-100GX-N units. The web based management interface also allows Network administrators to easily configure, update, and monitor every IW-100GX-N station. SNMP private MIBs are available for advanced users that prefer to manage devices through their own network manager. CERIO’s NGS Firmware uses the CenOS4.0 core. The firmware’s main functions are web login authentication and Thin Access Point (TAP) modes. CERIO’s CenOS 4.0 Access Point uses hotspot technology importing concepts. Main functions include authentication login support remote RADIUS Server, local user account, OAuth2.0 account and guest login in AAP mode. Cerio’s (Thin AP) wireless base station TAP function supports only GUI state monitor displays when acting as a Thin Access Point. Once this setting is operational, the device ends all NGS centralized control and management functions and operates strictly under the control and management of other supervising systems such as an AP utilizing CAP (Controller Access Point) mode. The thin AP deployment architecture acts to effectively improve network efficiency, and reduce security concerns of information theft from wired/wireless invades. Because no settings are stored in a Thin AP, device theft or invader intrusion would pose no threat to the networks security. Controller Access Point (CAP)- AP manager Administrators should use CAP mode to simultaneously managed APs of AAP and TAP mode. Centralized APs management enables control of Wi-Fi function / security / users authentication / firmware upgrade / system time / traffic monitoring / and system information. TAP mode supports GUI status monitoring, allowing administrators to facilitate audit APs. CERIO’s NGS Firmware also supports load balance management through TAP mode (Real-time user limitation). The firmware provides Traffic Monitoring and Graphical GUI Status Interface. Administrators can easily monitor system statuses and network traffic for each AP. IW-100GX-N eXtreme Power 11n 2.4Ghz 1×1 In Wall PoE Access Point with CenOS 4.0 software supports three operational modes: the (AAP) Authentication AP Mode/(TAP) Thin AP Mode/(CAP) Control AP Mode. It utilizes built-in remote management features that simplify deployment and reduce costs of continued maintenance of the WiFi hotspot Access Point. CERIO CenOS 4.0 Access Point provides authentication and authorization for a wireless networks. Administrator can select CAP (Control Access Point) mode to centralize management of network APs.